Since airlines use the hub and spoke method, you may not have the option. Your departing city may just not have a direct flight to your destination. Also, since demand drives up the prices for direct flights, connecting flights end up being cheaper. So are you willing to have a 1.5 hour layover at DFW/ATL/ORD in order to save $200-$300? For me, yes. That’s not how I ended at at Detroit Metropolitan Airport (DTW), though. I was flying Charlotte -> Altanta -> Amsterdam -> Dar es Salaam. Rain caused delays in Atlanta, so I was rebooked on another flight going out of Charlotte. Instead of connecting through Atlanta, I connected through Detroit to Amsterdam and onto my final destination. I’m not going to talk about how Delta was the only airline that experienced delays out of Atlanta (because of their insistence on not having margin) and I’m not going to talk about how they lost my luggage for a couple days. Let’s focus on the positives. I was dreading my six hour layover at Detroit Metropolitan Airport (DTW), I dreaded in vain. 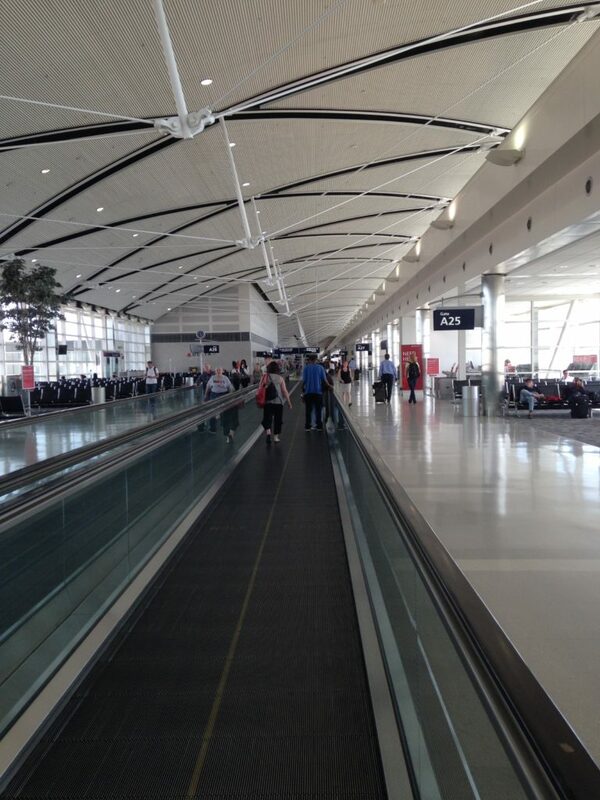 DTW is a beautiful airport that can easily accommodate you during a long layover. It was even rated one of America’s most luxurious airports for a layover. I would say that goes a little far, but my time there wasn’t bad at all. WiFi is free and there are plenty of places to sit and relax. Or you can do like I did, grab a coffee from Illy and go back and forth through the Light Tunnel (pictured above) for an hour or so. I was in awe. The airport is easy to get around. It has two terminals, the North Terminal and the McNamara Terminal. You can’t go between both without leaving security and taking a shuttle. The McNamara Terminal is the one I was one, it’s a mile long, so walk at your own risk. Don’t worry, though, it does have a tram going back and forth through the longer section. Both sections are connected by the Light Tunnel. There are plenty of coffee places and plenty of places to eat, as you can see below. There are a few things I look for in airports. Ease of transport within the airport, comfort (seating/plugs/shopping), food, and the wildcard. The wildcard is something unique that helps or hurts the airport. The Detroit Metropolitan Airport receives a layover grade of 10 out of 10. 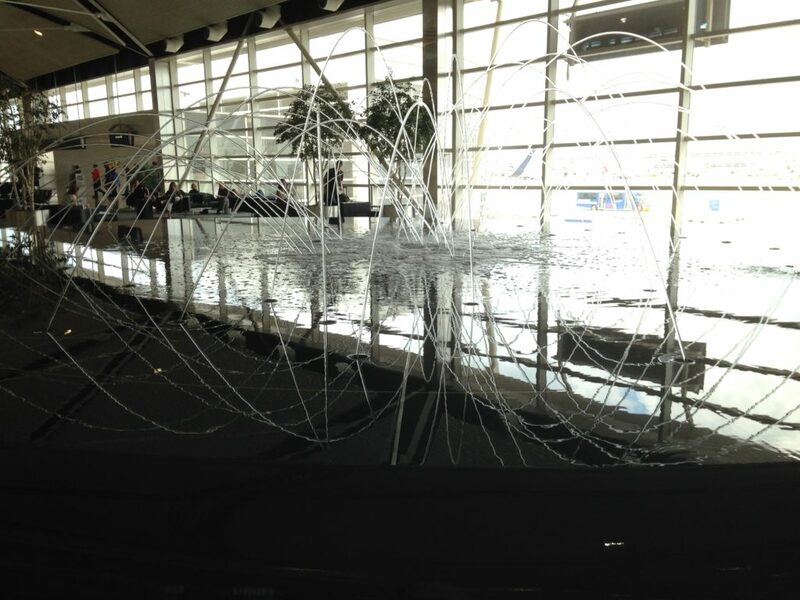 DTW is easy to get around, has all the food and coffee options you need, has the water display and the light tunnel, fast and free WiFi, and plenty of places to sit and plugin. I gave it 10 out of 10 because of two wildcards. 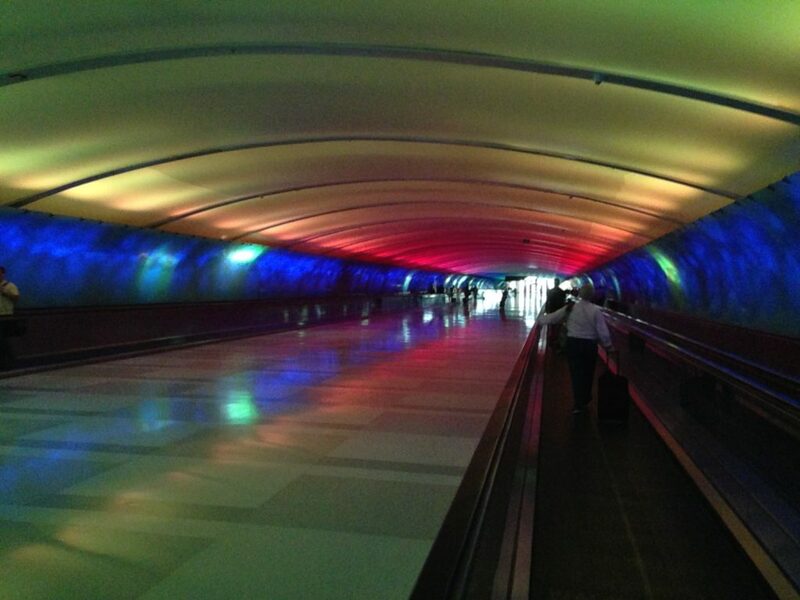 The first one is the light tunnel, which is completely unique to DTW. The second wildcard is the Westin Hotel located within the McNamara Terminal. You can check in and out of the hotel through the terminal. They also have a spa and sell day passes to their hotel (for a hefty fee).